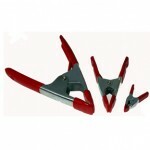 We have all kinds of seat weaving tools and chair caning tools to make your project go smoothly. De-Glue Goo® is the only non-toxic gel that will dissolve hide glue, white and yellow glues quickly and easily. We guarantee that De-Glue Goo® will dramatically cut your spline groove cleaning time. If you’ve got hard glue in the groove, don’t forget to order this. It’s amazing stuff, for sure. Wooden Cane Packing Tool cane be used to move individual or multiple canes during any stage of the hand-caning process. 5.25″ long. Hook one or both pins behind the cane and pull it into position. This tool makes caning easier with less repetitive motion and lighter finger load. Made in USA. Seat Weaving Tool Set – If you’re just starting out in chair caning and plan to do more, you need these tools. These are Made in the USA superb quality tools. One caning awl, one cane packing tool, one 3/16″ caning chisel, one 1/8″ caning chisel and a bone awl. Chisels are for cane webbing work. The awl and cane packing tool are for hand-caning. The bone awl is indispensable for seat weaving. Chair Caning Awl or basketry awl. Wood handle. Blade length 2.5 inches. 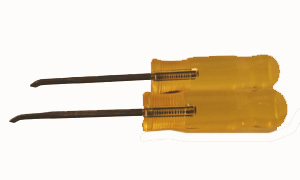 Overall length 6.25″. Made in USA. If you like your tools Made in the USA, this is the awl for you. *Awls are never suitable for use by children. Buy some of our Seat Weaving and Chair Caning Tools Best Sellers here, or click on the link button above. Seat Weaving Clamps hold your material on the chair side bars or dowels. Caning chisels clear the groove for cane webbing. 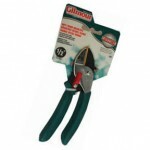 These shears are excellent for cutting all seat weaving materials.